If you read my previous submission about the start of our trip from Mombasa railway station on the night train to Nairobi, then perhaps you will remember the 'guitar man' singing Jim Reeves favourites, the train without its head, the dining car dinner served by staff immaculate in their whites and a meal that was, quite frankly, superb. There was something quite surreal as we lounged in our cabin prior to the late departure as the train attendant came up and down the corridor tapping on his mini-xylophone announcing 'dinner is served' So to the tinkle on his keyboard we arrived at the dining car to be greeted by the maitre d and shown to our seats. 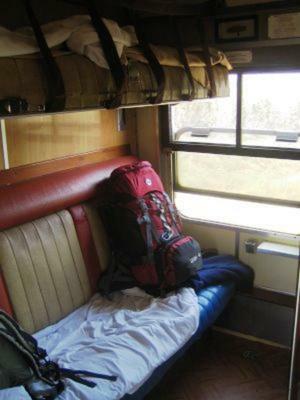 Just a word of caution - While the meal is being served then the train staff are preparing your cabin with bedding. Security of your valuables is essential so take them with you. After the meal it was back to the cabin and it was not so long that the train found its head engine and a slow journey started through the Mombasa suburbs and out into the Kenyan bush. Sleep? Oh yes! After a good meal and a glass of wine it was time to sleep. Peris had the bottom bunk and I was consigned to the upper level. To all travellers on this train let me tell you that the bunks only fit one person. So as I climbed in the dark back up to the upper bunk, using the sink as a foothold, the window as a handhold, the webbing straps as a belay, I managed to find security and cover myself in the clean sheets and blankets. We waited and waited but it was apparent this train was not going to move. The 'captain' announced that buses would be coming from Nairobi to pick up the passengers. I have to compliment the staff on the train as they whipped up a meal to sustain the passengers during the wait for the buses. I worked out the figures and it was at that moment I realised that we had to try something different. So Peris and I got out, climbed over the buffers of other trains and walked into the dry and dusty village of Sultan Hamud... grabbed a cold drink and then negoitated a price for a couple of small motorbikes with drivers to take us to the highway. Success and got back to train, back over the buffers and grabbed our cases while the rest of the passengers looked on in disbelief. The cases and bags ended up on one bike held on with bungy cord - I saw him fall over a couple of times on the way to the highway. Peris and I were cemented together on the back of the other small motor bike as the driver tried to maintain control. Something to do with the centre of gravity? Covered in red dust, we made it to the main Mombasa- Nairobi highway with the cases and grabbed the next matatu to Nairobi and then later back home to Nakuru tired and weary. It was only later that I tracked our journey on the edge of the Tsavo National Park and I often wonder what happened to the many other passengers. Peris and I made a good choice on the day but I would not recommend it to the faint of heart. I can look back and smile at our experience on the Train, and I have no regrets because I was aware from the beginning that anything could happen. So from our singer at Mombasa Station to the whole train experience and subsequent diversion on small motorbikes to the highway it was Kenya in all its diversity and challenges. Do you know what Archie? After the railway moved from steam to diesel powered locos and stopped being invested in or run efficiently as Kenya's most precious asset, the railway line just deteriorated. Staff were not paid for months, diesel engines were not being properly maintained, they often broke down and were always late. Railway traffic became so disrupted by accidents and breakdowns that timetables were meaningless. No one seemed to take pride in the railway anymore. The Government even sold it off because they just didn't appear to understand its uniqueness or how to run it profitably. However, in spite of this sad situation, the overnight passenger train journey from Mombasa to Nairobi is still considered by many to be one of Kenya's most memorable travel experiences. A Flight from Nairobi to Mombasa is extremely boring by by comparison. I lived an idyllic life in Mombasa and on the Kenya Coast when I was a child. My journey to and from boarding school in Nairobi always started with the most exciting train journey any child could imagine. The overnight school train that took us all to various schools in Nairobi and back each term, started from Mombasa at 5.30pm with a great cheer and many tearful mothers waving goodbye to their sons and daughters for the first time. I don't ever recall seeing a child who was crying!! With huge amounts of steam from the giant garrett steam loco and lots of whistle blowing from the engine driver, we left Mombasa behind and slowly meandered our way up the line towards Nairobi, stopping at most stations along the way to let an oncoming train pass. Dinner was in two shifts in the dining car (Juniors first)and then back to our 4 bunk compartments for a good nights sleep...some hope of that. Most of us stayed up and as dawn broke we saw the wild animals on the plains, stopping at Sultan Hamud and Athi River along the way. Breakfast like Dinner was announced by a man wearing a white jacket and trousers, playing a xylophone along the coach corridors. Some of us washed and tidied ourselves before having a full breakfast - porridge was a must before eggs and bacon - and then we prepared ourselves for arrival in Nairobi. As the train pulled into the station at about 9.30am chaos reigned until we were quickly assembled into our school groups and headed off to school. The overnight train journey back home from Nairobi to Mombasa at the end of term was even more of a jamboree. Much excitement and laughter with all of us looking forward to being back on the beach and having the time of our lives. Nothing has ever replaced that magical experience for me. "The Good Old EAR&H" telling the story of the journey to school and back on the Mombasa School Train. I still have his CD and LP which also contains many other amazing songs he wrote about life in Kenya.